Rose was a switch hitter and is the all-time MLB leader in hits (4,256), games played (3,562), at-bats (14,053), singles (3,215), and outs (10,328). He won three World Series rings, three batting titles, one Most Valuable Player Award, two Gold Gloves, and the Rookie of the Year Award, and also made 17 All-Star appearances at an unequaled five positions (second baseman, left fielder, right fielder, third baseman, and first baseman). Rose won both of his Gold Gloves when he was an outfielder, in 1969 and 1970. The Cincinnati Reds of the 1970s earned the nickname "the Big Red Machine" and are widely acknowledged to be one of the greatest teams of all time. Rose was on a team with many great players that included future Hall of Famers Johnny Bench, Joe Morgan and Tony Pérez, and he was viewed as one of the club's leaders. On May 5, 1978, Rose became the 13th player in major league history to garner his 3,000th career hit when he singled off of Montreal Expos pitcher Steve Rogers in front of 37,823 fans at home field Riverfront Stadium . On June 14, 1978 in Cincinnati, Rose singled in the first inning off Cubs pitcher Dave Roberts; Rose would proceed to get a hit in every game he played until August 1, making a run at Joe DiMaggio's record 56-game hitting streak, which had stood virtually unchallenged for 37 years. The streak started quietly, but by the time it had reached 30 games, the media took notice and a pool of reporters accompanied Rose and the Reds to every game. On July 19 against the Phillies, Rose was hitless going into the eighth inning when he walked. His team was trailing in the ninth inning and the streak appeared over, but the Reds batted through their entire lineup and gave Rose another chance to bat. Rose faced Ron Reed and laid down a perfect bunt single to extend the streak to 32 games. He would eventually tie Willie Keeler's 1897 single season National League record at 44 games, but the streak came to an end on August 1 when Gene Garber of the Atlanta Braves struck out Rose in the ninth inning. With two outs and a 2-2 count, Garber decided not to challenge Rose with a fastball. He took full advantage of Rose's predicament by throwing him an off-speed pitch out of the strike zone, which Rose swung at and missed. Rose was sour after the game; he blasted Garber and the Braves for treating the situation "like it was the ninth inning of the seventh game of the World Series". Garber was not insulted by Rose and took the comment as a compliment: "I said to myself, 'Well, thanks, Pete. That's how I try to pitch every time I'm in a game'." Pete Rose's number 14 was retired by the Cincinnati Reds in 2016. On April 30, 1988, during a home game against the New York Mets, with two out in the top of the ninth inning, Mookie Wilson hit what looked like a routine ground ball to the shortstop, but the throw to first base was wide and pulled the first baseman's foot off the bag. Umpire Dave Pallone didn't immediately make the safe call and the first baseman waited for the call instead of making a play at the plate, allowing Howard Johnson to score all way from second base with what would turn out to be the game-winning run. Rose vehemently argued the call and forcefully pushed the umpire twice with his shoulder and forearm, knocking Pallone several feet backward. Pallone promptly ejected Rose, per longstanding rules that call for immediate ejection for even touching an umpire. Rose had to be forcibly restrained by his own coaches as he came back at Pallone. In the time it took to remove Rose from the field, Cincinnati fans began showering the field with objects that included radios and cigarette lighters. Even though the inning was not over, everybody retreated to the dugouts. Reds' owner Marge Schott posted a message onto the electronic billboard, asking fans to stop throwing objects onto the field. On April 20, 1990, Rose pleaded guilty to two charges of filing false income tax returns not showing income he received from selling autographs and memorabilia and from horse racing winnings. On July 19, Rose was sentenced to five months in the medium security prison camp at the United States Penitentiary in Marion, Illinois, and fined $50,000. He was released on January 7, 1991, after having paid $366,041 in back taxes and interest and was required to perform 1,000 hours of community service. On February 4, 1991, the Hall of Fame voted formally to exclude individuals on the permanently ineligible list from being inducted into the Hall of Fame by way of the Baseball Writers' Association of America vote. However, a longstanding unwritten rule already barred permanently ineligible players from enshrinement. Rose is the only living former player on the ineligible list following the reinstatement of Jenrry Mejía (although former executives Chris Correa and John Coppolella are also on the list for other infractions). Players who were not selected by the BBWAA could be considered by the Veterans Committee in the first year after they would have lost their place on the Baseball Writers' ballot. Under the Hall's rules, players may appear on the ballot for only fifteen years, beginning five years after they retire. Had he not been banned from baseball, Rose's name could have been on the writers' ballot beginning in 1992 and ending in 2006. He would have been eligible for consideration by the Veterans Committee in 2007, but did not appear on the ballot. In 2008, the Veterans Committee barred players and managers on the ineligible list from consideration. Eight years later, Rose petitioned the Hall of Fame to permit his name to be submitted for induction, saying that he had not expected to be prevented from Hall of Fame consideration when agreeing to the lifetime ban. The criticism of Rose did not diminish after this admission—some Rose supporters were outraged Rose would reverse fifteen years of denial as part of a book publicity tour. In addition, the timing was called into question; by making his admission just two days after the Baseball Hall of Fame announced its class of 2004 inductees, Rose appeared to be linking himself publicly to the Hall. ^ "Pete Rose's history with the Yankees". pinstripeAlley.com. Retrieved 19 January 2019. ^ Petchesky, Barry (June 8, 2010). "This Is Pete Rose's Corked Bat". Deadspin. Gawker Media. Archived from the original on June 16, 2016. Retrieved June 16, 2016. ^ "Pete Rose timeline". reds.enquirer.com. Archived from the original on August 14, 2009. Retrieved June 16, 2010. ^ "No Gray Area Here". armchairqb.com. Archived from the original on November 21, 2008. Retrieved May 20, 2009. 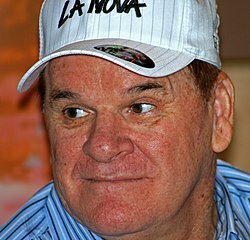 Wikimedia Commons has media related to Pete Rose.